Portland can be hard on its defining elements. As anyone who has pondered the fate of the late lamented Hotel Portland knows, progress does not march forward in Portland so much as it stumbles. In the process interesting things get knocked over. 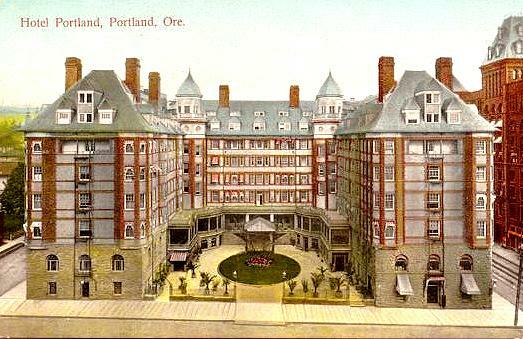 When it was completed in 1890 the Hotel Portland offered the most luxurious accommodations in the city. More important, it was the city’s signature showpiece. 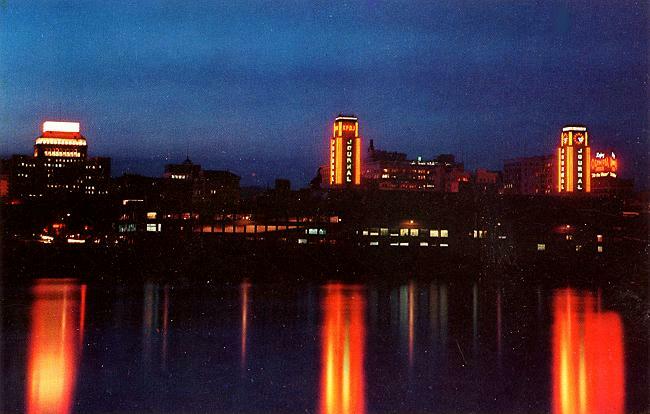 Less than ten years after the city was connected to the rest of the country by rail, it made a statement: In Portland we are civilized, just like San Francisco, just like Chicago, just like New York. Eleven presidents, including both Roosevelts stayed there. The hotel’s restaurants and music filled courtyard made it a meeting place for locals and visitors alike. 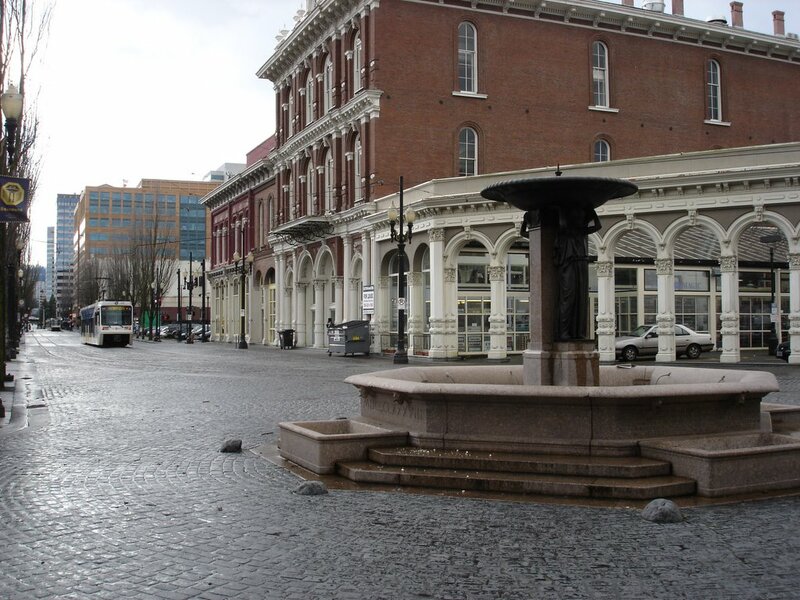 Food and entertainment, business and romance, it was the heart of Portland, in the heart of Portland. By mid century it was passé, lacking in the charm and convenience of the motel. The Meyer & Frank department store demolished it to add a parking lot to entice shoppers from the newly sprouted suburbs. It even had a service station. Yesterday’s parking lot is today’s Pioneer Courthouse Square, itself a worthy centerpiece. 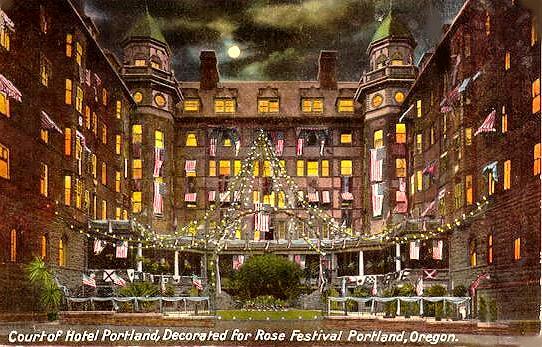 The Hotel Portland exists only in collective memory. There it would by joined in 1964 by the fire-doomed cathedral of wood that was the World Forestry building as the two most famous Portland buildings no longer in existence. One does not have to look as far back as the parking lot hungry 1950’s or the wholesale destruction of 1960’s urban renewal to find a cavalier attitude towards Portland’s essence. In July 1996 Front Avenue in downtown Portland was renamed to Naito Parkway after real estate mogul / civic booster Bill Naito who had died two months earlier. Bill Naito believed that the undervalued properties he owned in the then undervalued downtown of Portland had potential. He devoted his tireless energies to prove it. A well-liked and much missed personality, Bill Naito was a definite candidate to have something named for him. But should that something have been Front Avenue? In the late 1840’s when Portland was a small line of whitewashed wooden buildings between the river and a towering old growth forest, Front Street (Avenue would come much later) literally was Portland. 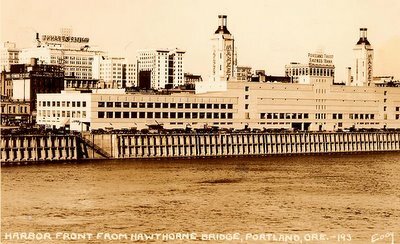 It was named, (like Front Streets across the west) because it fronted the main artery of commerce, in this case the Willamette River. The merchants of Front Street, the Ladds, Corbetts, Failings etc. would shape Portland into a major West Coast city during the half-century that followed. Front Street was where the goods of the surrounding countryside were transferred to ocean going ships and thus to the rest of the world. It was also where the cargo from distant ports of call was off-loaded to luxury starved pioneers. This exchange gave Portland (the furthest navigable point on the Willamette for ocean going vessels) reason to exist. It was also a good place to find a drink. As years went by, the city’s downtown moved inland and its port functions downstream. 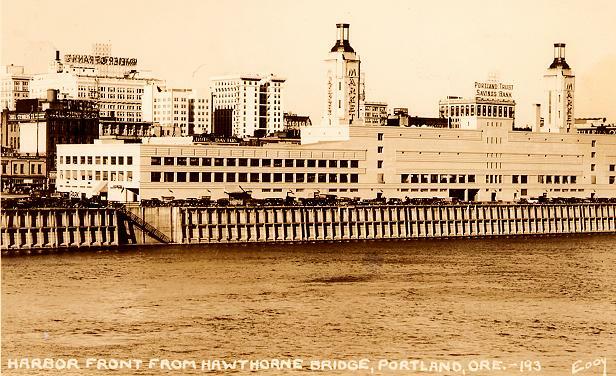 The warehouses docks and storefronts of Front Street gave way to the Harbor Drive freeway, which in turn was replaced by Tom McCall Waterfront Park. Through it all Front Avenue lent continuity between the small line of whitewashed buildings and the skyline of modern Portland. Arguably it was the most historic street in Portland. Is it too much to expect the first street of a city would be the last one to rename? 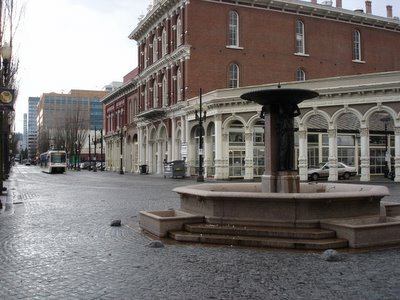 Portland’s latest try at self-administered plastic surgery is the Portland Development Commission’s goal to move the Saturday Market its efforts to revitalize the Old Town area in the Ankeny Square / Skidmore Fountain area. The Saturday Market, with its crafts, food and, well, eccentric entertainment (think of those “Lets Keep Portland Weird” bumper stickers) is one of those places that lift a city above the generic. Set beneath some of Portland’s remaining cast iron fronted buildings and using the otherwise dead space beneath the Burnside Bridge, the Saturday Market is a engaging blend of the 70’s and 80’s (the nineteen seventies and the eighteen eighties). Light rail stops right in the middle of it. In a complex set of circumstances that changes weekly, the Saturday Market faces losing the Skidmore Building to the Portland Development Commission (due to defaulting on its loans). The PDC would also like to see the market moved. It recommends a site with good transit access for markets next home. Portland has some experience in the moving of popular markets. In the 1920s there was a thriving farmers market on SW Yamhill between 3rd and 5th. Fred Meyer had his start there, selling coffee from a stand in the line of produce and flower stalls. To Portland’s planning commission however, the farmers market was unsanitary, congested and lacked room for expansion. 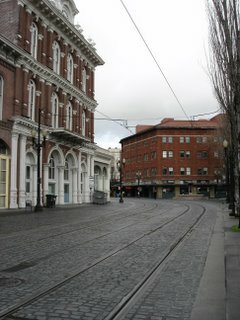 This lead to the building of the Portland Public Market on Front Avenue, completed in 1933. It was massive, three blocks long, it towered over the river between the Hawthorne and Morrison bridges. Depending on ones view, it could be seen as an Art Deco extravaganza (I would have loved to have seen it), a scandal (it had all the cost over-runs of today’s tram project, overlaid with charges of corruption and nepotism) or an outsized monstrosity. What it was not though, was a successful public market. Free parking and acres of space could not compete with the vibrant chaos of the (unsanitary, congested and cramped?) old Yamhill site. In World War-II the US Navy would lease the building and eventually the Oregon Journal newspaper purchased it. It was torn down in 1968. Today the site is part of Tom McCall Waterfront Park. There are lessons to be learned. Large-scale plans cannot guarantee public acceptance, subtle and elusive, which is based on affection, familiarity and accessibility. There are also lessons to be learned from Seattle’s Pike Street Market, an attraction for tourists and locals alike. Ankeny Square and its surrounding area has a huge potential to be expanded on, but it should come not at the cost of the Saturday Market. Recently nearby lots now used for parking have become available for development. A new group, ironically named Portland Public Market seeks to bring a new farmers market into the area. Sadly the group is eyeing the Saturday Market’s Skidmore Building as a possible home, if the building defaults to the Portland Development Commission. Meanwhile, the neighboring historic Newmark Theater Block has a sign announcing that it is up for lease. Looking toward Ankeny Square, The Newmark Theater & Skidmore Building. The ideal use for Ankeny Square would be a space flexible enough to allow a year round Saturday Market and a farmers market room to expand into, depending on the time of year, day, or even hour. If necessary, the square could be expanded by using some of the space soon to be vacated by the fire department. 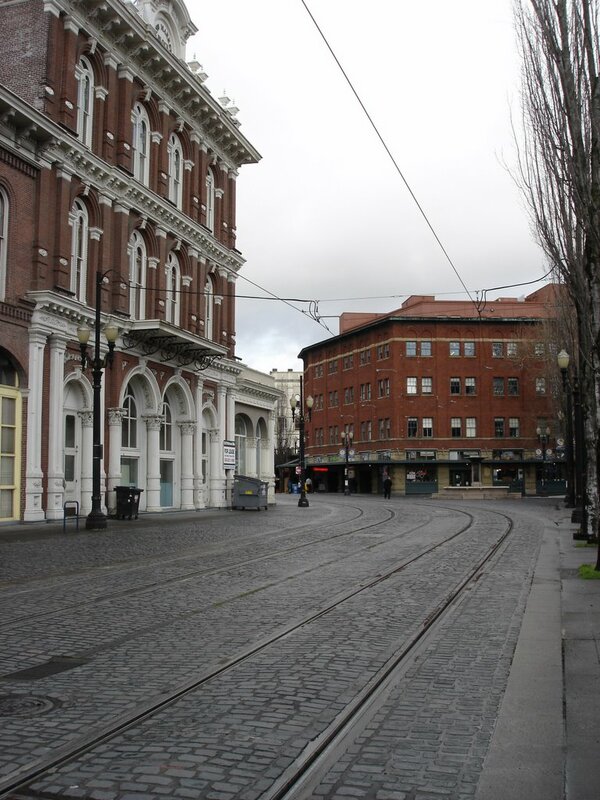 With the addition of new high-density housing, and a viable market space to the restaurants, shops and bars already on nearby Second Avenue, the area around Ankeny Square could be a mercantile counterpart to Pioneer Courthouse Square. Perhaps Portland’s own take on Barcelona’s Las Ramblas. It could even be a defining element of the city. But Portland can be hard on its defining elements. The Skidmore Fountain and Newmark Theater, looking south down 2nd Ave. Thanks to Mark Moore at www.pdxhistory.com for the historic pictures of the Hotel Portland and Portland Public Market.